Ahhhh remember the time when Hollywood knew how to make a horror movie. Great actors required - Not beautiful actors. Terrifying deaths required - Not gory deaths. A great score that fits the movie - Not a Nu-metal Emo soundtrack that sells a CD. The Omen is just that. A haunting movie that still chills me today. You see a dynamic acting performance will last even if the actors now appear to be dated. A good death will still scare you if you haven't tried to SFX above your weight. And a fantastic haunting powerful original soundtrack will still do the job it was designed for over 30 years later. This is scary stuff. Lights off, curtains drawn, volume up scary stuff. I don't want to watch the remake but I will have to. But you must not watch the remake. Not terrible, but safe and pointless, lacking any of the intensity of the original. Yep. 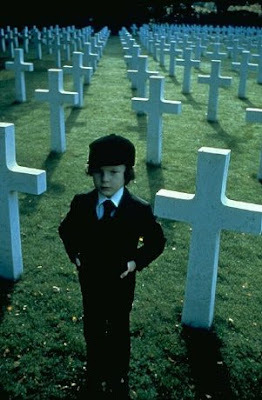 The Omen is a classic. The remake...isn't. It is bland and dull and utterly pointless. Avoid. Just stick with Messrs Donner, Peck, Remmick and creepy lil' Damien dude circa 1976. Hey, Doctor Who...look out for that falling weather vane...NOOOO! The Green Mile - What a Pisser!!! !